Wish to book a polar bear tour or need more information? Please fill out the form on the right or give us a call. Akook Arctic Adventures & Left Eye Productions, Inc.
Polar bear tours in the wild along the Alaskan arctic coast, including polar bear boat trips and polar bear photography tours. 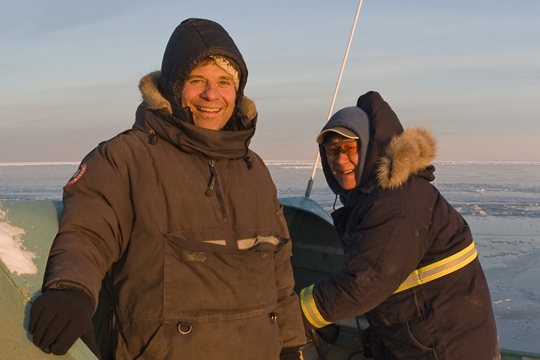 We specialize in personalized Arctic adventures! Alaskan travel and polar bear recommended resources and websites to help you plan your holiday viewing the majestic polar bear. Welcome to our Travel Resources page. Planning your vacation can be just as rewarding as the trip itself. Below are links to our favorite hotels, people, books, conservation groups, and more to inform, excite and prepare you for your polar bear viewing adventure! RAVN Airlines - The only commercial airline that flies into Barter Island daily. You can to Barter Island from either Fairbanks or Prudhoe Bay. There reservations telephone number is (800) 866-8394. Charter flights can be arranged for groups. Saturday flights may be added on by RAVN airlines by December or January. The only scheduled Sunday flights are through Prudhoe Bay. You can take RAVN from Anchorage through Prudhoe to Barter or you can catch an Alaska Airlines flight to Prudhoe then take RAVN to Barter Island. Delays and cancellations do happen and the airline will either try to work with the weather or reschedule to get people in or out as soon as they can. It's a good idea to leave a day or two on the back end of your trip in the event the airline needs to reschedule you for a day or two later. Waldo Arms Hotel - Nestled in the village of Kaktovik, homestyle feeling. You will want to arrive in Fairbanks the day before you fly to Barter Island as flights depart early the following morning. There are many hotels in the area and most have airport shuttles. La Quinta Inn & Suites - 3 minutes from the airport with breakfast included starting at 6 AM. Pike’s Waterfront Lodge - Spacious rooms and a 24 hour shuttle upon demand. If the forecast for the evening sky is clear, check in with the hotel on the northern lights forecast and best viewing areas. Bring a good pair of warm winter boots, a hat and gloves, thermals, down layers, and if it's early in the season (August through mid-September) rain gear would be good. We also highly recommend bringing the 5-hour hand and foot warmers that you can get from outdoor retailers. We have extra warm gear and arctic parkas for those who may need it. Pack as if you are going skiing but with extra gear since you are not moving aerobically. Alaska Wilderness League - Leader in the effort to preserve Alaska's wild lands and waters. National Resources Defense Council - the nation's most effective environmental action group. Working to curb global warming and protect polar bears. Polar Bears International - Polar bear conservation group—dedicated to saving polar bears by saving their sea ice habitat. Lots of polar bear facts, pictures, and information. Please contact us with any questions, to check availability, and to make your reservations for our unforgettable Barter Island polar bear viewing and photo boat tours.